In keeping with the Irish Government’s plans for a year long global commemoration of the Easter Rising of 1916, with events organised by Irish Embassies and various organisations around the world Crawley’s Celtic and Irish Cultural Society contributed with a special event at The Hawth Theatre on Friday 4th November. 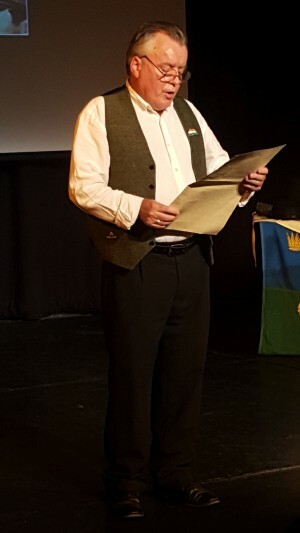 The event ‘One Easter Morn’ taken from a well known ballad of the era told the story in poetry, prose, music and song of the most significant week in recent Irish History where an ill-fated, poorly planned but determined Insurrection started Ireland’s final push to claim Independence. John Nolan, Chair of the Celtic and Irish Cultural Society was pleased with the way the night went. 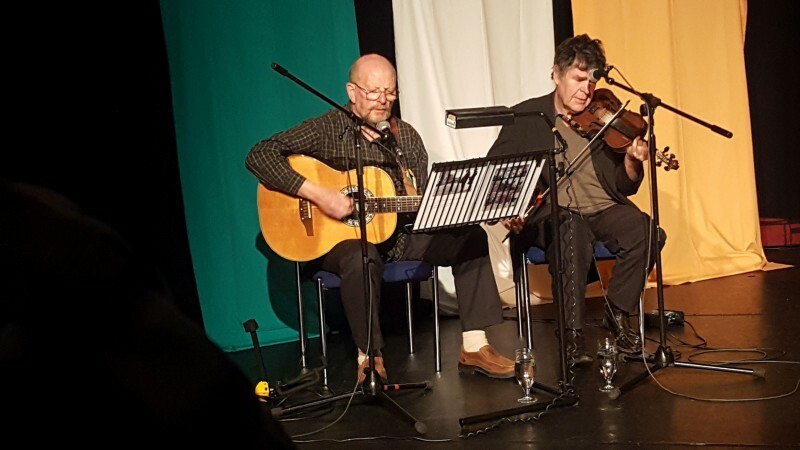 ” ‘One Easter Morn’ has provided the opportunity for Crawley’s audience to familiarise themselves with the distinctive dynamics of Irish history and we are more that happy with how everything went. As involvement in the First World War had a major impact on Ireland, so too the Rising was an important event in British history. The happenings of Easter Week was the beginning of a new era between the two nations and ‘One Easter Morn’ gave the attendance that chance to look back over the last 100 years and take stock of the distance travelled. The event and story behind it comes from Dublin based barrister James Stephen’s notes and first-hand experience of the days and nights of Easter Week leading up to the capture and execution of the leaders. With the use of slide projections compare Gerry Molumby of Triskellion Irish Theatre (aka the Master of Ceremonies on the Mainstage at our Crawley Irish Festivals) set the scene and narrated the show telling the story of Easter Week with live music from Irish Mist with Joe Giltrap on guitar and bodhran and Malcolm Rodgers on fiddle singing the famous ballads now enshrined in Ireland’s music culture of ‘Rebellion’. Ireland is well known for its emigration and as a result a large community settled after the passing of the New Towns Act which created the town now call Crawley. These pioneers of the 50s and 60s have brought their Irishness to the town and the following generations now add to this legacy and continue to develop the cultural and social community of today and contribute to a welfare support function in recognising the narratives of settled emigrants. The show was well received not only by Irish residents but the broader population of Crawley. Organised by Crawley based The Celtic and Irish Cultural Society (C.I.C.S.) who’s aims are to promote and support Celtic & Irish Cultural and heritage events in the Southeast of England. The society is motivated to ensure that Irish cultural heritage is demonstrated to the community within is coverage area by promoting and supporting the contribution of the Irish emigrant communities. The society liaises closely with statutory authorities to ensure that matters affecting Irish emigrant populations are addressed. It’s activities are key to addressing social inclusion to integrate the Irish community more fully into Crawley’s multicultural society and provide opportunities for social interaction and creative expression to help people develop social skills, build their confidence and lead more active and healthy lives.